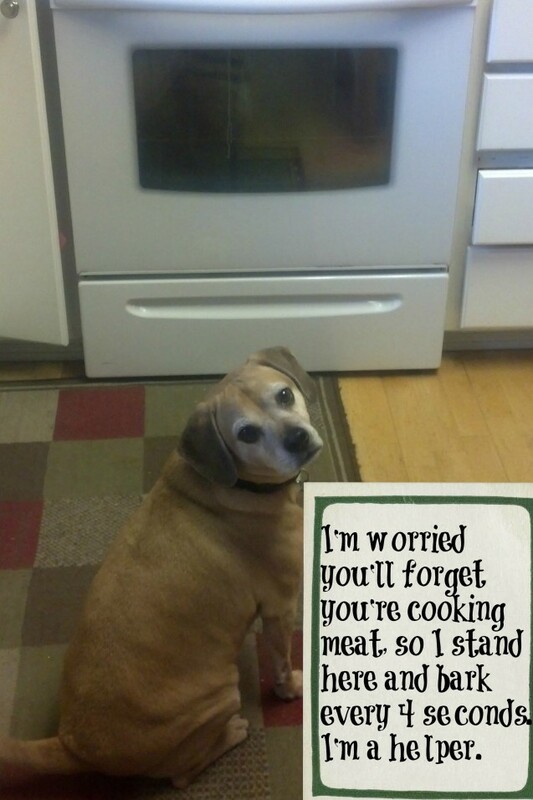 I’m worried you’ll forget you’re cooking meat, so I’ll stand here and bark every 4 seconds. I’m a helper. This is Jake, our 7 year old recuse puggle. He normally doesn’t make a sound, except when there’s meat in the oven, slow cooker, the stockpot or on the BBQ. Especially pork. Jake loses his mind for pork. Jake has good taste. My cats follow me around the house when there’s meat cooking. Oh oh so cute! My cat and dog double as USDA inspectors: the higher the price per pound, the more insistent their demands for samples. Maybe you can shame them for that!! “Too well-behaved” could be a shaming offense! Dogs and cats shaming their peers by behaving themselves ! Yeah I like that alot Andrea/Bobie !